Last updated 28 August 2018 . By Olivia Cheves. A game-changer for the Soho date-night scene, Grays & Feather is pitching up in Covent Garden at the end of the month to bring bottles of the bubbly stuff from around the globe to their new Wellington Street location. With a popular stall at the Southbank Food Market, this is the first bricks-and-mortar venue for the boutique wine-sellers and it's set to be a rather snazzy little spot. Boasting a huge variety of sparkling wines, their menu pulls focus to small, interesting, independent producers with stories that will wow the wine buffs and intrigue the novices. 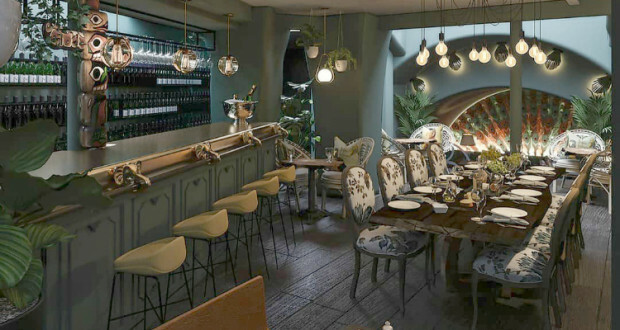 As for the interiors, prepare to be transported to a magical overgrown garden as plants and botanicals - both the real kind and on the upholstery - litter the room, and stylish shelves showcase the goods on offer at this exciting new watering hole.